- With mobile document destruction at your site, you can see for yourself that all of your confidential materials are shredded before they leave your facilities. - By contracting for on-site paper shredding, your employees do not have to spend hours and hours of their time managing records destruction. - Mobile services can minimize the space you need for storage of documents waiting to be destroyed. You can schedule services to shred your papers in any size batches you prefer. - Mobile shredding saves transport costs by combining the document destruction with trucking to the recycling center in one smooth operation. - Mobile document shredding saves your company from having to invest in its own shredding systems. 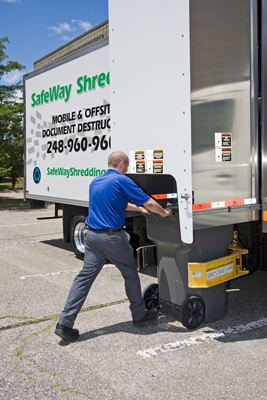 In terms of cost efficiency, energy efficiency, convenience, and the best protection of client privacy and confidential business data, mobile shredding could be a vital part of your company's paper handling system.